If this was a cricket scorecard, it would have read: Liew c Liew b Liew. Long story short, by the time I got home at 6:30 last night, Heather had been having regular contractions for a couple of hours, so we knew we were in for an eventful evening. Having phoned my parents – who had been on yellow alert for more than a fortnight – and asked them to head westwards out of London, we decided to settle in and have as normal an evening as possible under the circumstances to take our minds off things. Which meant putting Zac to bed, followed by takeaway curry in front of Countdown and Hustle on TV. The grandparents pitched up at about 9:30, quickly followed by our midwife, Amanda. A quick physical exam suggested everything was fine and we were still several hours away from serious action, so Amanda headed off, suggesting we all get some sleep. We were preparing for bed at around 11:10 when, without any warning, all hell broke loose. Two huge contractions sent Heather scrambling downstairs while I dashed around phoning Amanda, grabbing towels, firing up our birth playlist on the iPod and so on. Although things had moved on too far too fast to make use of the birthing pool, fortunately everything else was proceeding without complication. Textbook stuff. The only problem was I hadn’t actually read the textbook. I had literally just been settling down with the book to revise the details I had so studiously memorised when Zac was born when I was suddenly called up to perform my practical exam. And as the contractions came harder and faster, it became clear that Amanda wasn’t going to get here in time. I was on my own. Anyway, I had enough of my wits about me to project an air of calm reassurance for Heather (in truth, there simply wasn’t enough time for panic to set in), to remind her about her breathing at the appropriate moments, and to be in position as the baby manoeuvred itself into launch position with one contraction, crowned with the next one, and finally with a deft wriggle of the shoulders slithered gracefully out where I was waiting to make the catch with a towel at the ready. A quick glance at the clock to note the time of birth, and a pause to register which song was playing on our randomised playlist – Sinead O’Connor’s classic version of Prince’s ‘Nothing Compares 2 U’, in case you were wondering – and job done. Amanda arrived five minutes later. Which was good, because (a) I got to cut the cord without having to worry about cleaning up the surrounding mess and (b) I really didn’t fancy filling in the paperwork myself. By 1 o’clock, everything that needed to be done was done (including a beer for me to balance the slide down from my adrenalin high). We started the evening as a household of three; we ended it as a family of four. 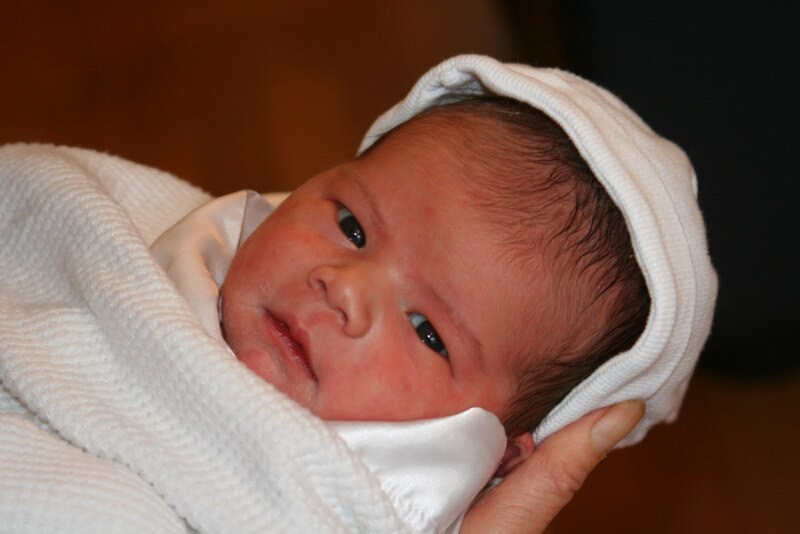 This entry and the series of blogs preceding it comprise the birth journal of Tobias Alexander Liew, who was born at 11:27pm on Tuesday 19th January 2010, weighing 8 lbs 9 oz. Welcome to your life, Toby. Make it a good ‘un. What an amazing post and an amazing achievement. Incredibly quick arrival into the world! Indeed! In some ways it was probably better that it was quick. It was amazing how much I remembered about the basics of what I needed to do when I suddenly needed to do it! All three of ours have been fairly quick – something my wife is *much* more thankful for than I! – but Toby was the quickest by a distance. It was all a bit of a blur, but thankfully I remembered to do all the right things while dashing about almost on auto-pilot. Having been involved in the birth of our first son – also at home – it was a less scary experience than it would have been had Toby been our first! Brilliant post! I think midhusband could catch on, and well done to you for delivering Tobias (top credit to Amanda, obvs!) I did laugh about you taking time to flick on the birth playlist! I don’t know about Amanda but I couldn’t have given a monkeys for the soundtrack to pushing out a wee monkey! I found you via #ArchiveDay and I’m glad I did. Thanks Tas. Even now I’m not sure quite how I managed it – thankfully all went smoothly! Oh, that’s such a shame, Merlinda, even though I know real life means it isn’t always possible to be there. I’ve been fortunate enough to be present at all three of our children’s births, two of which were at home so I got to be actively involved in the whole process (a little *too* involved in this case!) I consider myself lucky to have been there. To be honest I did the easy bit, namely (a) don’t panic and (b) don’t drop the baby. Everything really did happen so fast that there was no time than to do anything else other than the basics of what needed to be done. The rest was largely auto-pilot. It definitely helped that this was our second rather than our first baby, so at least I knew what I was doing. And didn’t do anything embarrasing like pass out! This is so awesome. My wife and I want to do this for our second kiddo. Definitely glad it went right for sure! Must’ve been an interesting ride. We just want to get all the things together we need and just be prepared and go for it. Obviously have safety precautions in place though.